It’s always been difficult to become a doctor. Medicine is a high-prestige, high-pay profession, and, as a result, competition for spots in medical schools is fierce. Recently, however, many applicants have complained that it seems like it’s gotten even harder than yesteryear. Analysis courtesy of trevorkleetutor.com . As it turns out, they’re right. A recent analysis of medical school data by Trevor Klee, Tutor has shown that medical school matriculations have not kept pace with the increasing number of applicants to medical school or the increasing number of college graduates. In fact, the acceptance rate for medical schools has decreased by nearly 20% since 2002, plummeting to only 40%. 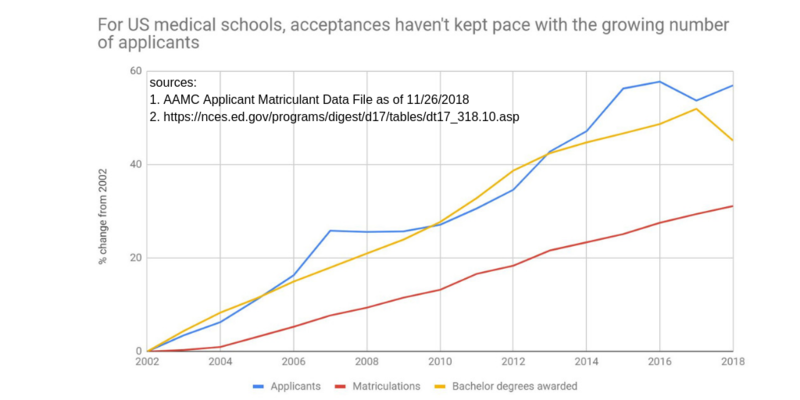 Given that the number of medical schools each applicant applies to has also risen dramatically, this means one thing for sure: applicants have to work ever more diligently to get into a school.